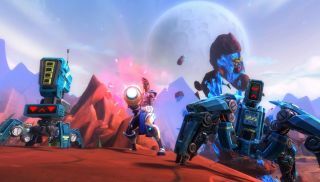 Of the many Wildstar DevSpeak videos released, most have focused on the upcoming MMO's PvE game. Finally, though, Carbine are offering a proper look at the PvP modes - from the small-scale Arenas, to the objective focused Battlegrounds. The main focus of this video is how the AoE-based telegraph system creates a PvP mode with a focus on manually aimed attacks, and frantic and constant dodging. No wonder the characters are all so in shape. We've got you covered for Wildstar coverage. Leif tried a 40-person raid , I was taken through an Adventure dungeon , and Chris got to try the open-world PvP element . Wildstar is due out on June 3rd.